Mary VanScyoc Obituary - Shippensburg, Pennsylvania | Fogelsanger - Bricker Funeral Home, Inc.
Mary Catherine VanScyoc, 87, of The Village at Luther Ridge, Chambersburg, formerly of Shippensburg, passed away Wednesday, July 4, 2018. 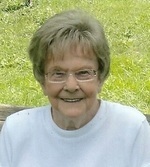 She was born July 22, 1930 in Letterkenny Twp., Franklin County. Mary was a daughter of the late Charles W. and Verma E. Hammond Reed. After 45 years working for the Grief Company in Shippensburg, Mary retired in 1992. She was a member of the former First Court Chapter # 470 Order of the Eastern Star, Shippensburg AARP # 2525 and the Shippensburg Senior Citizens Group # 1. In addition to her parents Mary was preceded in death by her husband, Robert M. VanScyoc who passed away October 23, 1995. Three brothers and three sisters are also deceased. She is survived by a son, Paul E. Hockenberry of Telford, PA, a step-son, William (Brenda) VanScyoc of Pleasant Hall, a step-daughter, Victoria (Michael) Rideout of Chambersburg, a sister, Annabell Reeder of Spring Run, six grandchildren, eight great-grandchildren, three great-great-grandchildren and numerous nieces and nephews. Funeral services will be held Saturday, July 14, 2018 at 11:00 a.m. in the Fogelsanger-Bricker Funeral Home & Crematorium, Shippensburg. Burial will be in Spring Hill Cemetery. A viewing will be held one hour prior to the services in the funeral home. In lieu of flowers memorial contributions may be made to the American Cancer Society, P.O. Box 897, Hershey, PA 17033 or the American Heart Association, 1019 Mumma Rd., Wormleysburg, PA 17043. Online condolences may be expressed at www.fogelsanger-brickerfuneralhome.com.